Howdy! Merry Turkey Day and stuff(ing)! Hardy har. Ahem. Yes, I'm a nerd, shush. I hope you're all having a great holiday! My plan is to do as little as possible - mostly watching movies and knitting (shhh don't tell my mom). We won't do Thanksgiving until Saturday where we'll meet up with Nate's family for the UGA/Tech game, a birthday party, and a turkey dinner. Do it big, right? 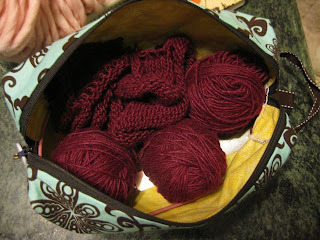 I still knit, I swear. In fact, I've cast on so much stuff lately that I'm going to have to buy a new set of needles because I've run out of Denise cables. Knitpicks perhaps? I'd love to splurge and get the new Addis set, but I don't know that it would be a good investment at this moment, what with Christmas and traveling to DC on the horizon. Wanna see what I've been working on? Seriously, somebody stop me. I think my castonitis might be a procrastination technique. Or maybe it's a way to channel my anxiety*. Whatever, it's not cool. 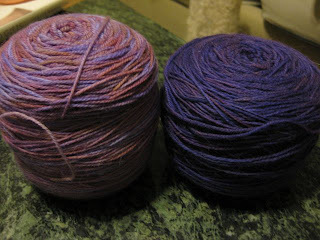 I'm about to cast on for Transistion Gloves using these two Dream in Color colorways (Wisterious and Visual Purple), as soon as I can figure out how to buy the pattern. 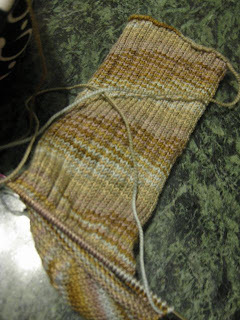 I'm working on a 3x1 rib sock in some Shibui sock yarn that I couldn't walk away from at Knitch a few weeks ago. Then there's the Men's Cashmere Scarf from Last Minute Knitted Gifts for a friend in some Berroco Ultra Alpaca. 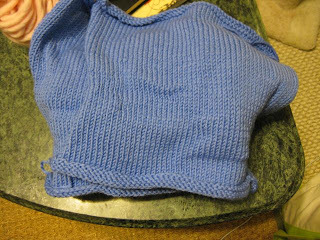 And a baby sweater (1st birthday) that's two weeks late and still needs sleeves in some Berroco Comfy (or something). My momentarily-ripped-but-about-to-be-recast-on Hourglass Sweater (also from Last Minute Knitted Gifts) in Noro Cash Iroha. I don't know what I was drinking when I cast on the size 41. OHHAI. I'm barely a 37 bust. Jeebus. Regardless, I want this bad, so I'm starting again today. 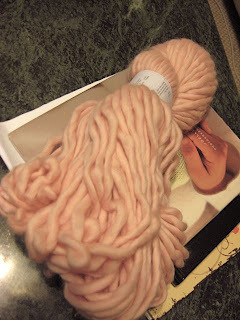 And I'll be magically transforming this skein of Twinkle bulky into a moebius cowl this afternoon. Cause, you know, I totally need one. RIGHT NOW. 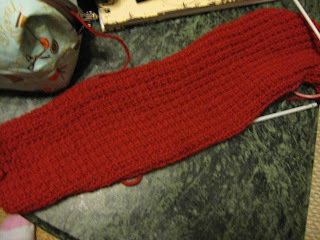 Nevermind this Purl Soho Scarf I've been working on for a few months. 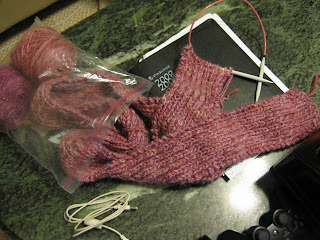 There are also two pairs of socks in the works, and an alpaca hat I can't seem to find. I think my hands may have missed the knitting. This is just too much. I have to finish something, right? Jeez. Anyway, hope you all have a great holiday! The semester is almost over, so I'll be back soon! *So I had a freak out day (or two) a few weeks ago and couldn't get myself under control and therefore went to the doctor to "discuss" anxiety meds. He gave me some. I am taking them. The first day I wasn't so sure. I felt extremely fucked up. The second day wasn't much better and I said forget it. I'd rather be freaked out all the time than feel like an insane person. A few days later I decided to give it another go. So far so good. Suffocating under the anxiety = bad. Breathing = good. I'm only able to take half a pill a day, and I discovered the hard way that even half a Xanax on a bad day is TOO MUCH. Maybe an eigth would be ok, but a half knocked me out for several hours. I can't be productive if I'm asleep. I'm absolutely fine though, I've just taken on WAY too much and I can't walk away from any of it. It will work itself out very soon. I can hardly wait for Jan. 20th! It's seriously taken a few days for this to sink in for me, but I'm SOOOO freaking happy about Obama's win on Tuesday!!! I think I might have political PTSD or something because at first I was just numb. I really couldn't believe it. Now I'm alternating between elation and tears. Sometimes both at the same time. I know there's a lot of work ahead of us, but I'm ready and I'm working on a few ideas about how I want to contribute. I'm so full of hope right now, I can hardly stand myself. I feel like I can do anything! So I'm harnessing that energy for myself and I'm working on my own 75 day plan. Like I need more things to focus on, I know! Carrie and I canvassing on Sunday. We were so nervous, but people were GREAT and so happy to see us. Carrie's sporting her Sarah Palin glasses and I'm channeling Paris Hilton. 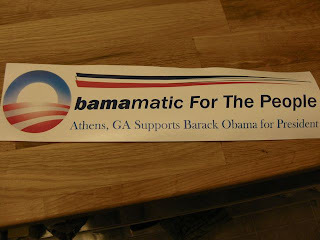 This sticker is seen on many a car in the Athens area. The man who owns Weaver D's (the restaurant that REM's Automatic for the People album is named for) had these printed up. Nate got one for his car and one extra. The only newspapers I could find on Tuesday. Athens local paper, UGA campus paper and a USA today. 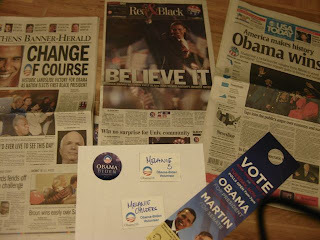 Plus my stickers from volunteering and a left over door hanger from canvassing. Tuesday I helped out at the Democratic HQ in town. I'm so proud to have worked with this campaign and the other folks involved. They were so full of love and hope. 10 or so local restaurants donated TONS of food for our canvassers, voter drivers and poll folks - I was blown away by the generosity!! 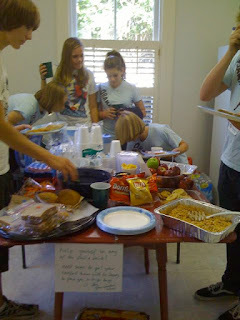 This group of high school kids were especially enthusiastic and helpful. They can't even vote yet. One guy had a great set of pictures playing over and over on his laptop. I Kinnear'd it. 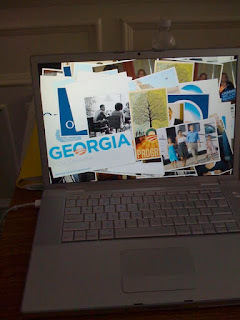 I ordered some posters, buttons and shirts from the Obama store today and I'm thinking about putting together a collage or shadow box or something to preserve my cool stuff. I can't even express what I'm feeling right now. So much love for everyone.